How do I add a matching opportunity for my AmplifyATX.org profile? 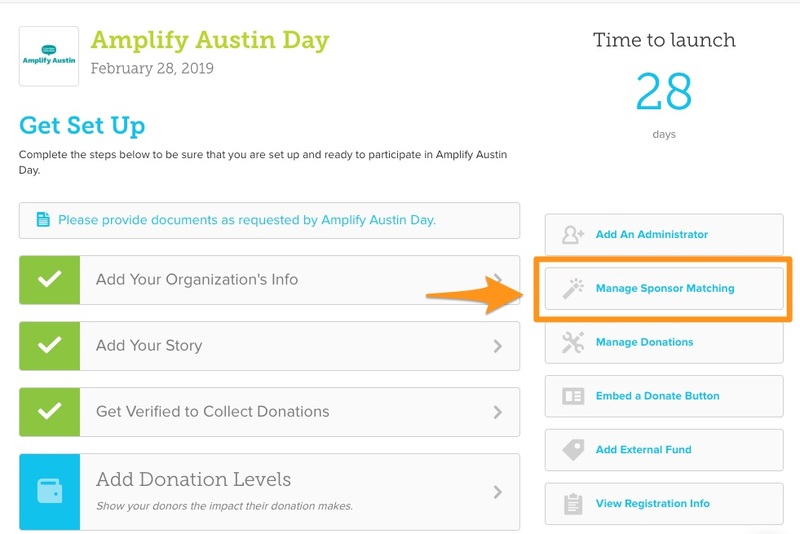 Learn how to add a matching commitment to your AmplifyATX.org profile. From there, click the "Add Match Commitment" button to begin customizing your matching opportunity. If the sponsor of your match has a photo or logo that you/they would like to feature, you can upload that here to be displayed along with your match. This section is optional, but to add a photo, click “Select Image” and click “Apply” once you’ve adjusted it. If you click "Keep Sponsor Anonymous", this image will not show. This is the name of your sponsor. Enter in how your sponsor would like to be recognized for their sponsorship. 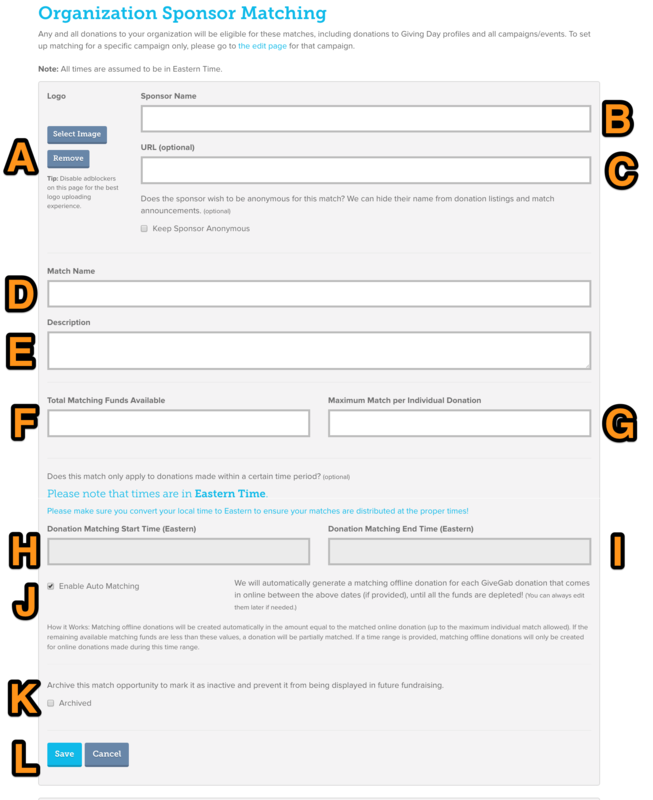 Here you’ll want to add the name of your match as it will appear to donors. Think of this as the promotional name of your match - such as "Double Your Impact!" Here you’ll want to input the total amount of funds available for this specific match. For example, if your match is for $25,000, you'll enter 25000. You do not need '$' or commas. If there is a maximum match amount per individual donation you can set that number under the box that says “Maximum Match per Individual Donation”. For example, if you set your max to $100, if someone makes a donation for $101 or more, the match will only match up to $100. 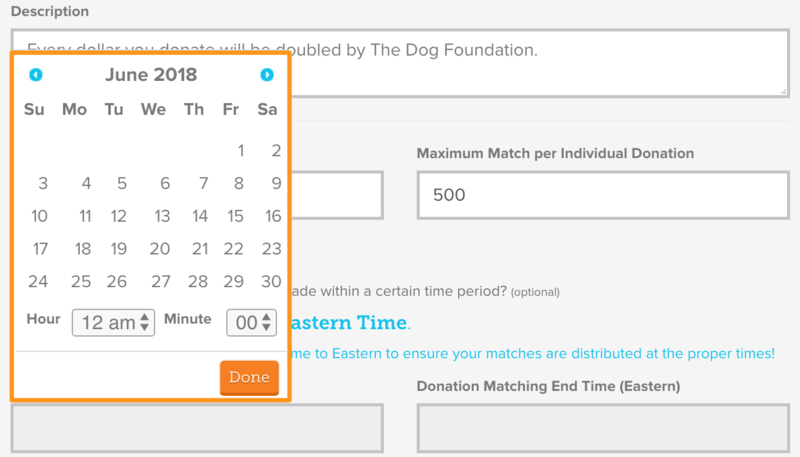 If there is a point where donations will no longer be counted towards matching funds, you can set the end date of the match by clicking the box under “Donation Matching End Time” and selecting the date and time you want the match to end from the drop down menu. This feature is will automatically be disabled for Amplify Austin Day. When this box is checked, an automatic offline donation would be made for the match. Since offline donations to not attribute to your totals or to the prize pool, auto-matching is not applicable for Amplify Austin organizations. If this match is out of date or completed, you can "Archive" your match. This will stop the match from displaying on your fundraising campaign. However, this will notremove the donations from your campaign.